What sort of untapped abilities lie within the human brain? Could we summon the powers of telepathy, telekinesis or mind control if we only knew how? 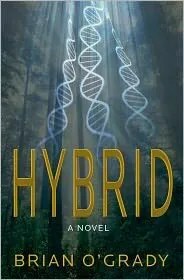 Dr. Brian O’Grady, a Washington neurosurgeon, explores these intriguing questions in his pulse-pounding medical thriller HYBRID (The Fiction Studio; April 2011). “We have limitless connections between the nerve cells in our brains, yet we only use about 10 percent. Imagine if we could unlock our vast potential?” he asks. The key in Dr. O’Grady’s debut novel is a virus, which unleashes a chain of events in same spine-tingling spirit of suspense as The Andromeda Strain and the X-Files. Since her escape from quarantine, Amanda has been in hiding slowly realizing the powers that could have only come from her infection. She can sense things, do things using her mind, things that are incredible and sometimes incredibly dark. But as she resists the pull toward violence, a new survivor has entered her consciousness – one without her will to block evil impulses. One who revels in bloodlust and seeks to expand his mastery by forcing the end of human society. And he’s coming for Amanda. MEDICAL SUSPENSE TO GIVE AWAY. Where is everybody? Guess that I will be first. From what I have read about biological weapons they one of the worst, scariest weapons possible. Even back in World War, my 1st husband's ancestor breathed in mustard gas, he returned from the war and never recovered from it. I publicly follow you with Goggle Friends Connect. I follow you with Twitter. I love medical mysteries and my thoughts on bio weapons is one of utter fear as there is so much unknown! I am not very good at Twitter but I tweeted about the giveaway and here is the status proof…is that the right way? I don't know if that is what you want?